Ten years in the writing, Suzanne Cameron Linder Hurley’s book on Hugh L. McColl Jr.’s family is on press. This painstakingly researched history is illustrated with beautiful photography by Jack Hurley, Keith Fergus and others, along with many archival images from the McColl Personal Collection. This comprehensive account begins with the clan’s early years in Scotland and covers sixteen centuries of history, from Colla Uais, a fourth century Irish king, to the present day Carolina McColls. The first part of the book applies to all McColls (or McCalls) who can trace their families to Appin, Scotland. The second aspect of the story focuses on life in America from 1775 to 1870, between the American Revolution and the end of the Civil War. The last portion examines the post-war recovery of the New South, led by such men as Duncan D. McColl, Sr, his sons, and ultimately his great grandson, Hugh McColl Jr, under whose leadership, the Bank of America became one of the biggest, if not the biggest bank in the world. 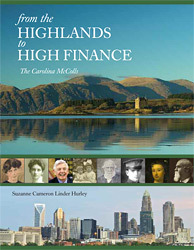 To purchase this title please click on this link: From the Highlands to High Finance?